I wrote a great review of the Avenson STO-2 before my computer suffered a crash caused by an audio driver. Ha! Such is life. I'll keep this review short. The Avenson STO-2 small diaphragm condenser microphone requires the obligatory 48 volts of phantom power. The mics are small, very small -- five inches long. The STO-2 is an omni pattern mic. Most project studios tend to be heavy on cardioid pattern mics so an omni can be a refreshing addition. Omni mics do not possess any proximity effect. Placement becomes less critical to the bass response of the microphone. Avenson Audio packages the STO-2 in pairs. 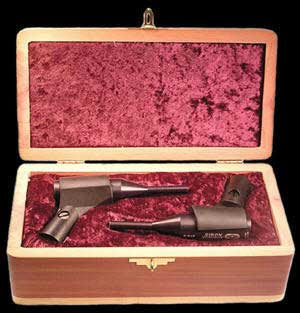 The pairs come in wooden cases along with microphone clips. I'm a musician who got into recording as a extension of the composing process. One thing I like as a musician is to play my instrument and to find the sweet spot with my ears where the sound of my instrument and the sound of the room converge to create ear candy. I remember the first time I used the Avenson STO-2 I put one up to record an acoustic guitar. I heard this sound in the headphones that gave me that ear candy sound of instrument and room. I smiled. You usually get something that's a little dark or a little bright. But, you usually never get something so close to what you hear with your ears. I liked the Avenson STO-2 used as a single or in pairs on many instruments. I did not find their omni pattern a detriment in a home recording environment. I remember recording one session where we switched to a cardioid pattern large condenser which picked up more ambient noise. I never found ambient noise a problem with the ST0-2. My preferred uses of the STO-2 seemed to be on stringed instruments, piano and percussion. I wanted to try pipe organ but did not get the chance. Some people today seem to be addicted to mics with a presence peak on the high end. Refreshingly, the STO-2 does not possess such hype on the high end. Hey, most of do not use tape anymore. In digital, you don't need peaky mics to compensate for the highs that might otherwise get lost going to tape. One thing about the STO-2's lack of hyped and peaky highs is that you get a little more freedom when positioning them as overheads. Cymbals ordinarily do not come across as harsh as they might with other mics. Overall, the STO-2 sounds smooth (meaning an absence of peaks or dips in frequency response) and transparent (detailed, clear, not muddy or smeared). The only drawback I see for the STO-2 is that it's sold in pairs. I like to have the option of buying just one of any microphone. The Bottom Line: I found the Avenson STO-2 pair to be a solid value at their street price. Most mics of this quality tend to be priced around this amount as singles. I also liked how they seemed to hear things they way my ears heard them. It's pretty much like being there. Highly recommended.